In my last post, Drunk Printing, I mentioned that I was searching for a good knit top pattern to make some tops for my work wardrobe. One sure way to punch up the volume in your work wardrobe is to have a variety of tops to wear with suits. Confession time: for each suit I own, I really only have one dedicated top to wear with that suit. So if you’ve seen me wear my brown suit, you’ve seen me wear my ice blue top from Ann Taylor with it pretty much all the time. It’s time to change things up a bit, don’t you think? New Look: because, darn! they’re cheap. Jalie: because Dawn loves them and I keep hearing how great they are with knit patterns. I like the top the model is wearing the best for under suits. Super cute. Second runner-up would be view B or E, but to be honest with you I can’t tell what the difference is between the two. This pattern is my favorite. Next up is this little cowl neck number. I loves me a cowl neck. But as Trena pointed out in the comments of the last post, they sometimes don’t work well under suits. I’ll have to mull that one over for a while. And the final New Look pattern is this cute knot top. Love it. I looked at all of Jalie’s offerings and really liked this one. I have never used Jalie before, so I bought only one pattern to try them out. Dawn likes them and she’s made some really cute clothes with their patterns, so I thought I’d give them a whirl. Of course, after I made this purchase, I saw all the suggestions made in the comments to my last post. Robin suggested Simplicity 4095 but I am just not feeling crossover tops right now. Still it’s a pretty top and a good suggestion. Sue suggested Butterick 5354 which I loved and will definitely buy sometime soon. Trena suggested Butterick 5283 and Burda 7866. I liked both of them, so they’re going on my sometime soon list too. I am very happy with my pattern choices (current and future) and already feel the warm glow of a great wardrobe descending onto my being. 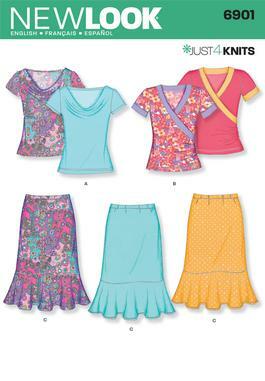 I can’t wait to receive my new patterns and start the work wardrobe manufacturing pronto. This entry was posted in Burda, Butterick, New Look, Pattern Review, Sewing, Simplicity, Tops, Work Wardrobe. Bookmark the permalink. I’ve tried most of the Jalie ones, and they are great! I also tried Butterick 5354 and it was easy and it fits great! I also love the ones you bought! I wouldn’t call NL 6901 a cowl, it’s more of a drape neck, so I think you could get away with it under a jacket. I have an older NL with a similar neck, and I’m pretty sure I wore it that way. My off-grain fabric was orange and flowery, that should tell you how far back that experience goes :-). But alas, it has stuck in my mind. My hair has never been the same.. I have a purchased cowl neck blouse in a woven fabric with the cowl set into a conventional V neck. This arrangement ensures that the semi-fitted blouse stays in place when you take your jacket on and off. The cowl stays nicely arranged no matter what! I really must make a pattern from this – I love cowl necks! Off grain fabric is bargain priced, but no bargain! If you try to line up the pattern it will never hang correctly and if you just go by the grain, if you are anything like me who can’t stand if a picture frame is crooked it will drive you crazy. I am always on the look out for good knit tops too. Some good choices here. Remember though that if you want to wear it under a suit, be careful on depth of the sleeve. It needs to be either sleeveless (Coco did a lot of these for under suit jackets) or narrow. You won’t be comfortable with a deep armhole. Hi Elizabeth, Just a note to say that I stumbled on your blog yesterday and than spent way too much time surfing around it..it’s great. I’m a beginner sewist too, so I can relate to where you are at with sewing -I’m there too. I have a blog but rarely mention sewing on it because I’m too slow – every step still requires careful thinking through. Kudos to you for the courage to tackle the lined trench coat. It looks great. Thanks again for an entertaining blog, I’ll be back to check it out..